Last night marked the official beginning of the new board, and today marks my official commitment to keeping you guys informed of what’s going on, the best I can. 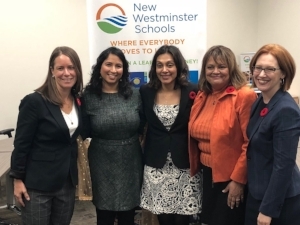 So for those of you that don’t know, the new board consists of new Trustees Anita Ansari, Dee Beattie, Danielle Connelly, Maya Russell and myself and returning Trustees Mark Gifford and Mary Lalji. The inaugural meeting was as expected: retiring Chair, Mark Gifford, made a few remarks, us trustees fumbled our words as we bravely took our Oath of Office, there was some humorous family photoshoots, followed by board elections. Anita nominated Mark and he was acclaimed to the position after Danielle had declined Mary’s nomination. With the election of five new trustees, along with relatively new senior staff, it’s important that we have a successful transition period that puts the needs of our district first. Mark brings a wealth of experience that will guide and support us as we learn our new roles, and for that reason, he was definitely the right choice. Dee nominated Anita, and with no other nominations, she was acclaimed to the role. Anita is a great listener, quick learner and she will do fantastic! Danielle was acclaimed to the position after I had nominated her. She’s a passionate, motivated trustee and I know she’ll do a great job representing our board. Dee Beattie was acclaimed the alternate, following Maya’s nomination. Dee was acclaimed to this position and I was acclaimed as an alternate, after Maya nominated us both. Dee is committed to strengthening our public education system and she too will do a great job representing our board. 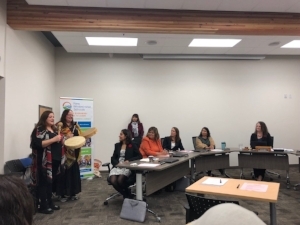 The evening was truly made special through a smudging ceremony led by District Aboriginal Coordinator, Bertha Lansdowne, alongside the drumming songs of Rosalyn Swanson and Danielle Smith. This served as a powerful reminder in support of reconciliation and our district’s commitment to cultural inclusivity. With the burning of sage and cedar, positive energy comes to surround and guide the new board as we get started.